Congratulations bro, I hope that you get each day better, 1% per day! Not necessarily, your sprites are getting more interesting each day, which is a good thing. It took a few years for most of us to get a decent hold onto pixels and to be able to create a great-looking items. Just do your job and take your time, it's all about doing it constantly and not giving up. Nope, nope and nope. A newbie should NEVER, ever try to use more shades of each color because he or she will get lost, to simply put it. In the beginning, they don't really know how pixels work and by adding even more to that, it would be like adding a fuel to a fire - not good. First of all, they should focus on learning how to use as small amount of colors as possible, 3 of each + black outline would be the best to get going. Another thing you should focus on, try to think outside the box - think of spriting as a sandbox and you are a kid with toys to play with, but in this scenario, your sandbox is an empty canvas and your toys - a pencil and colors to fill it. The point is, you CAN experiment, you can do any design you want to, try to make every item unique in its own way. Last thing i'd like to mention are pure pixel-art techniques; outline-making, shading or color-picking techniques are the ones you should focus on. To simply put it: Outline usually musn't be jagged, shading should have its lightning source clearly visible (lighter/darker elements of an item/outfit/anything) and colors can be picked in a way they convert into another color, its a technique called hue-shifting and it makes a big difference. He won't be able to get nowhere using only 2~3 tones per color as you suggest because he's already doing it, he will just get frustrated. I would recommend you use at least 8 tones per color with a good contrast. Also, search about "anti-aliasing" tutorials, it's kinda what Royalz tried to apply on your handle but with a few adjustments because it need 3 pixels thickness to work properly. Why won't he then use paint brush and let a program do everything for him then? First he needs to learn some pixel art principles (like doing anti-aliasing properly), or he will fail hard as you did using brushes. Thank you guys for all your feedback! I mean, really. It really helps me to do better (even if you can't see progress, I can just ensure you that I'll be trying almost all the different things you told me already!). Today I tried to re-pixel some boots. And I failed so hard with the "front" one... Anyways, here's my attempt to use more pixels in shading. I used way more contrast and I think way more colors. b) Making it look like "3d". Some perspectives are relatively "easy" for me (I mean, I'm not master in painting it, but I for sure can visualize it for myself) but the others one... I can't even think of (like this "front" boot for example). a) I recommend you to don't do outlines, you'll take minutes/hours to think the outline of something pixel by pixel while you can do shapes with a hard brush in seconds. Work with the inner part, the shape. A silhouette brings more information than lines and you can understand the volume to paint inside. Also, do it bigger, you have a 32x32 canvas. b) For some "flat" perspectives like the "front boot", what will do it looks 3D is the shading. This is in no-way masterpiece, but for the first time I had a feeling that "I know what I'm doing". I mean, obviously, the effect is still not satisfying, but that one sprite got me feeling like I'm doing progress somehow. Thanks once again, and - Yes, Leshrot, I made sprites way smaller than it should be (not even full 32x32 potential). Found some very old tutorial that helped me when I was starting my journey as spriter. Made by Titadmarde on WOT Forum (2006~2009). That gave me the first understanding of what AA is. 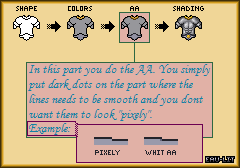 I have to make clear that's a very primitive concept about AA and shading that they had in their time, but still helpful for any beginner. Fur and shape gives me a trouble, but I hope it'll be easier soon. Thanks for linking usefull stuff here, really appreciate it! Your best sprite so far imo. Sorry for not posting the last 3 days, but I have some emergency. I'll be back in a few days and I'll post overdue sprites. I can only ensure that it's not dictated by laziness, nor by reluctance. <- Not tibia style, but let's go. I started to think to try some tiles/woods/trees etc instead of items. Is it too soon or should I give it a try?